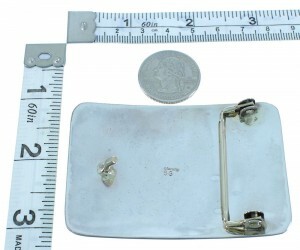 Belt buckle measures approximately 2" long, 3" wide, will fit a belt that is up to 1-1/2" wide. Excellent craftsmanship is shown throughout this amazing belt buckle! This piece of Native American jewelry is Navajo overlay hand crafted by artist Stanley Gene, out of genuine sterling silver. Overlay is a process that utilizes at least two layers of sterling silver. One layer forms the foundation, while the second is used to design the individual detailed overlay. 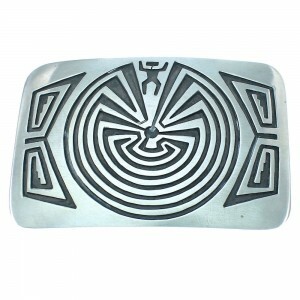 In this belt buckle, the second layer forms a wonderful Man in the Maze and stamped boarder patterns that gives the piece a magnificent finish. The man in the maze design depicts the common symbol of Life and Choice. Some Native Americans have adopted this symbol because it signifies life's cycles and eternal motions, along with the choices we are confronted with. The right choices lead us to a point of harmony with all things, no matter how hard or long the road taken. The belt buckle is stamped sterling and hallmarked.